1.Can achieve fast and frequent turn-on and off the circuit, an unlimited times of switching. 2.The on-off process does not produce noise, no spark, no electromagnetic interference. 3.Longer life than conventional electromagnetic relays. 4.Using dual MOS parallel active output, lower internal resistance, more current, power is strong, to meet the use of most equipment. 5.Emergency stop function (STOP key), with reverse protection, reverse does not burn. 6.Sleep mode, if there is no operation within 5 minutes, the display will be turned off automatically, press any button will wake it up. 7.You can set different OP, CL, LOP parameters,these parameters are independent of each other and are saved separately. 1. 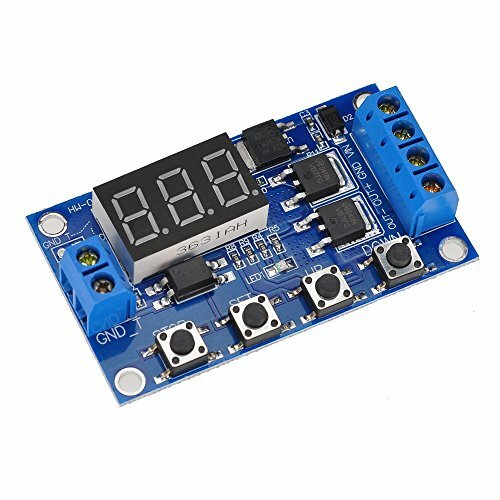 The module is an active output, the output voltage is equal to the input voltage (DC 5-36V).